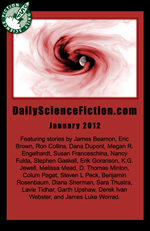 Daily Science Fiction is a professional publication of science fiction, fantasy, slipstream, and more. If you'd like to submit your original stories or artwork for publication, this is the place. Please note that we are not accepting story submissions from December 24th through January 2nd. Thank You. If you're not already logged in as an author, you'll be prompted to login or create an author account at the outset of the submissions process. If you have questions about submitting materials the site, please contact us.